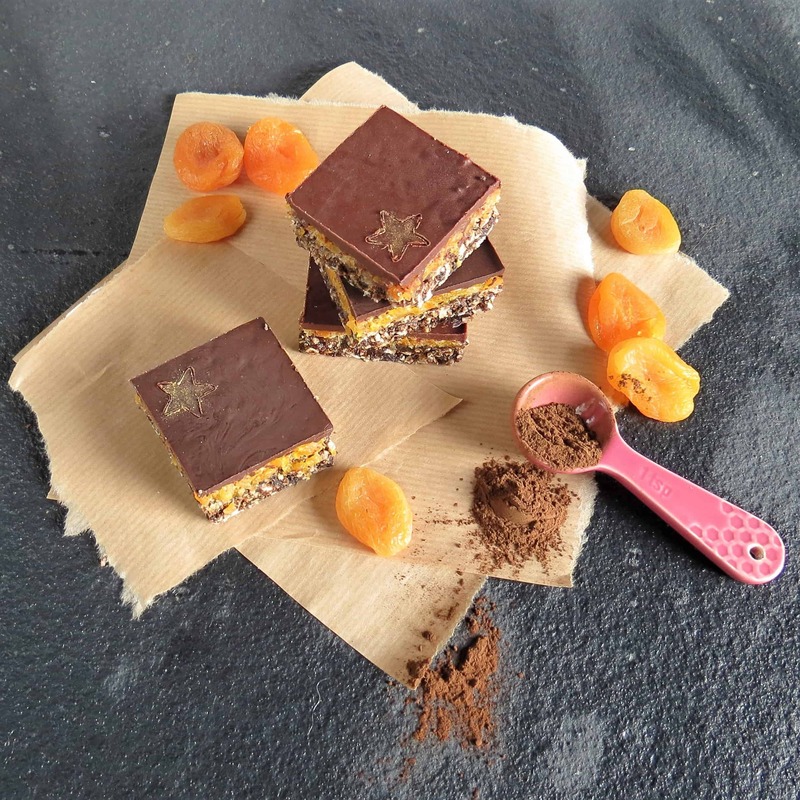 My Apricot Cacao Raw Squares came following a major lull in energy. The sugar cravings kicked in again this week, not sure if it’s the poopy weather and my body telling me to bulk up and hibernate or the lack of sleep I’m getting ergo, complete sugar crash by the afternoon? Either way, I needed to make a sweet treat, but not too icky sweet and bad for you! 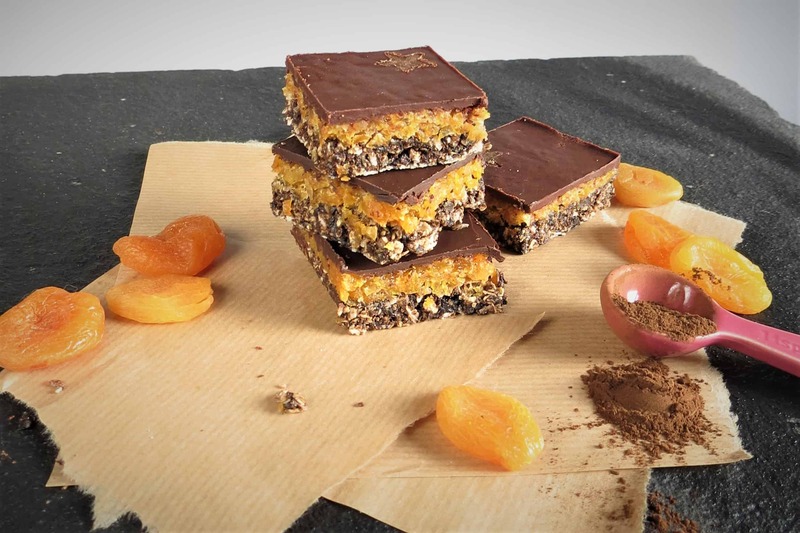 Enter my Apricot Cacao Raw Squares. I’ve made something very similar in the past in the form of my Cherry Choc Raw Squares but this time I wanted a treat with a difference, a multi-layered treat perhaps (oh, I reckon I can rustle one up! )…There had been a packed of dried apricots looking longingly at me every time I opened my cupboard so I decided to put them to good use. This may look a complicated treat but I promise you it’s not. To be fair, none of my recipes are mind boggling when it comes to following them, it’s how I like to rock and roll. Simply add all the base ingredients to a blender/food processor and whizz them all up until they come together into a paste. In a lined square brownie tin (mine's 8"x8") press the prune mixture down firmly. Repeat the blending process with the apricot layer ingredients, the water is to loosen the mixture to enable you to whizz it all up. Smooth the chocolate over the top of the apricot layer. I keep these squares in the fridge to keep them hard and fresh. thank you Mandy, still have a couple left in the fridge, just goes to show how long they can last…I did hide them at the back so no one else would find them (guilty pleasures)! Oh! These bars look great! I love the look of these! I may well be making a ‘version’ of these without the oats…perhaps with extra nuts…to suit the low carb diet that seems to suit me ;)! YUM. I’m sure you could easily adapt them Vicki they are very filling so watch out! Thank you, lol, you’re not the first to say their hubby would enjoy it, could be onto something here! Hi Rebecca,thanks fro sharing the recipe.I love the use of chocolate topping on the recipe.